Bethel (בית אל, "House of God")—also written as Beth El or Beth-El—was an ancient Israelite town, located about ten miles north of Jerusalem, famous for its shrine. According to the biblical account, altars were established at Bethel by both Abraham and Jacob, and the latter described it as a place of awesome spiritual power (Gen. 28:17). Bethel also housed the Ark of the Covenant during the period of the judges, when it was also a sacred place to offer sacrifices to God and receive oracles from God. During the period of divided kingdoms, Bethel was an official shrine of the northern Kingdom of Israel, founded by Jeroboam I as a pilgrimage site competing with the southern Temple of Jerusalem. As such, it was the subject of intense criticism by the biblical writers. The prophets condemned its allegedly decadent priesthood, and it was accused by writers of Kings and Chronicles of housing an idolatrous statue of a golden bull calf. The shrine was thus destroyed by King Josiah of Judah during his reforms of the seventh century B.C.E. Bethel nevertheless remains a sacred place in the collective memory of both Jews and Christians. Located about ten miles north of Jerusalem near the border of Israel and Judah, Bethel was known as Luz in pre-Israelite times (Gen. 28:19). The name “Bethel” (beit el) means the "house (or place) of God." Abraham, according to Genesis 12:8, built an altar east of Bethel shortly after arriving in Canaan from Haran. Later, Jacob, believing the place to be the "gate of heaven," named it Bethel. 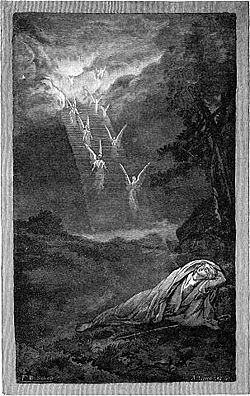 He is depicted as erecting a sacred pillar there shortly after having the dream of "Jacob's Ladder" (Gen. 28:18). The early shrine was apparently outside of the town of Luz, probably at a "high place." The exact location of either the primitive altar or later shrine at Bethel remains undetermined by archaeologists, although some believe the town may have been uncovered. In the Bible, God calls Jacob to return to Canaan from exile in Haran, and is reported to have said: "I am the God of Bethel" (Gen. 31:13). Later, after Jacob's family had settled near Shechem but had run afoul of the local population, God commanded him to move to Bethel and (re)build an altar there. The town nearby is still identified as Luz at this point, and Jacob called the place "El Bethel." When Deborah, the nurse of Jacob's mother Rebekah, died and was buried beneath an oak there, the site also became known as Allon Bacuth—“Weeping Oak” (Gen. 35:8). In the Book of Joshua, Bethel was temporarily abandoned by the Canaanites when Joshua's forces encamped between Ai and Bethel and drew its residents out (Josh. 8:17). The king of Bethel is listed among 31 monarchs reportedly conquered by Joshua and the Israelites (Josh. 12). The fate of the residents of Bethel is not mentioned, but the citizens of nearby Ai were reportedly all slaughtered by the Israelites. It may be notable that, in renewing the covenant between God and the people in Canaan, Joshua bypassed the ancient altar at Bethel in favor of constructing a new shrine at Mount Ebal, opposite Mount Gerezim, near Shechem. When the Israelites suffered a terrible defeat at the hands of Benjamin, they returned to Bethel to weep, fast, and pray "before the Lord." Directed again by Yahweh to attack, this time they won a mighty victory. The shrine at Shiloh, a few miles north of Bethel, housed the Ark during the ministry of the judge Eli and his sons, but Bethel was still prominent. The prophet Samuel's circuit included a stop at the shrine, and 1 Samuel 10:3 identifies Bethel as a holy place where people offered sacrifices to God. The future king David sent gifts to certain elders of the Tribe of Judah residing at Bethel to gain their favor (1 Sam. 30:27). We do not hear of Bethel again until it assumed a far different role in the biblical narrative. After the establishment of the Israelite monarchy and its subsequent division under Rehoboam of Judah and Jeroboam I of Israel, Bethel became a center of controversy. Jeroboam expanded and improved the shrine, hoping to make it—together with a major northern altar in the territory of Dan—a spiritual center of his kingdom. The Bethel shrine also competed spiritually and financially with the Temple of Jerusalem. In dedicating the new altar at Bethel, Jeroboam is quoted as declaring to his people: "It is too much for you to go up to Jerusalem." His next sentence could have been one of several meanings depending on how it is translated. The Hebrew reads: "'elohiym Yisra'el `alah 'erets Mitsrayim." Its probable intent was "God who brought you out of the land of Egypt is here (in Bethel)." Its usual translation is "Here are your gods who brought you out of the land of Egypt." While Jeroboam clearly intended the shrine to be devoted to Yahweh (or El, the two names now referring to the same deity), the biblical account portrays Bethel, from this point on, to be a center of idolatry. The focus of this accusation was the golden (possibly bronze) statue of a bull calf erected by Jeroboam to adorn the shrine's entrance. Throughout the narrative in Kings and Chronicles, the kings of Israel are condemned for repeating the idolatrous "sin of Jeroboam" in failing to shut down Bethel's shrine. 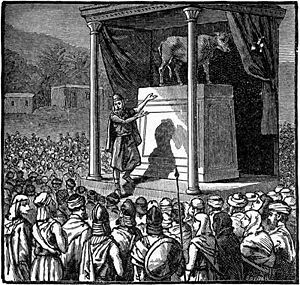 Even King Jehu, who "destroyed Baal worship in Israel," was criticized because: "He did not turn away from the sins of Jeroboam, son of Nebat, which he had caused Israel to commit—the worship of the golden calves at Bethel and Dan" (2 Kings 10:29). However, even after the conquest of the Northern Kingdom by Assyria in the eighth century B.C.E., the shrine of Bethel retained its importance as a center of devotion to the God of Israel. The Assyrians even sent exiled Israelite priests back to Bethel in order to placate "the God of the Land" and teach its new inhabitants how to worship (2 Kings 17:28). Later, when King Josiah of Judah (seventh century B.C.E.) took possession of parts of the old Northern Kingdom, he destroyed the altar at Bethel that had been erected by Jeroboam (2 Kings 23:15). After the Jews returned from exile in Babylon, Bethel belonged to Judea rather than Samaria (Ezra 2:28). At the time of the Maccabees it housed Syrian garrisons (1 Macc. 9:50). It is mentioned by the first Christian topographer, the "Pilgrim of Bordeaux." The fifth-century church historian Eusebius of Caesaria refers to Bethel as a small country town. Thereafter, it begins to fade from the historical record. Many Jewish congregations today call their congregations "Beth El," meaning "house of God," and also honoring the sacred history of the place itself. Some Christian churches also use this name as well. Biblical scholars point out that El is the name of the chief ancient Canaanite deity, as well as being the name of the Hebrew God in the patriarchal narratives. Since the patriarchs arrived in Canaan well after El was formally worshiped there, it is likely that the name Bethel ("house of El") did not actually originate with the patriarchs but was appropriated later by the Israelites, who attributed the naming of the shrine to their forefather, Jacob. The fact that Jacob builds the altar at Bethel on two occasions reflects two accounts compiled later into the Book of Genesis (see documentary hypothesis). That Bethel was an important religious shrine for the Israelites during the period of the judges likely has a strong historical basis, and its importance to the northern Kingdom of Israel is undoubted. Although the shrine itself has not yet been located by archaeologists, its northern counterpart at tel Dan has been the subject of an important excavation, revealing a major ancient altar much in keeping with the biblical account. A possible reason for the failure to locate the shrine may be that it was obliterated during the reform of King Josiah of Judah. "He burned the high place (at Bethel) and ground it to powder, and burned the Asherah pole also" (2 Kings 23:15). It would be a supreme irony if the "Ashera pole" destroyed by Josiah was in fact the sacred pillar erected at Bethel by Jacob. While priestly corruption must have been a real problem at Bethel—as indeed it was at Jerusalem itself according to the prophets—the accusation of idolatry must be taken with a grain of salt. The mere presence of a golden bull calf statue there is insufficient evidence, since the Temple of Jerusalem itself housed a huge gilded statue of two winged cherubim. In the opinion of one archaeologist: "It is possible that in the religion of the northern tribes of Israel the bull was considered either as the symbol of the God of Israel or its pedestal (recalling the function of the Cherubim in the temple of Jerusalem)." Indeed some scholars affirm that Bethel was actually more Yahweh-oriented than the Temple of Jerusalem itself, since the statement "behold your God who brought you up out of Egypt" is a typical Yahwistic confession. Until inscriptions or other writings are uncovered revealing the northern perspective on the controversy, historians need to consider that biblical writers present a theologically biased view of the true nature of the Bethel shrine in its later days. ↑ 1.0 1.1 Amihai Mazar, Archeology of the Land of the Bible-10,000-586 B.C.E. (Doubleday, 1990, ISBN 038523970X). ↑ Frank Moore Cross, Canaanite Myth and Hebrew Epic (Cambridge, MA: Harvard University Press, 1973; reprint edition, 1997, ISBN 978-0674091764). ↑ Jules Francis Gomes, The Sanctuary of Bethel and the Configuration of Israelite Identity (Walter de Gruyter, 2006, ISBN 978-3110189933). This page was last modified on 23 November 2018, at 17:10.